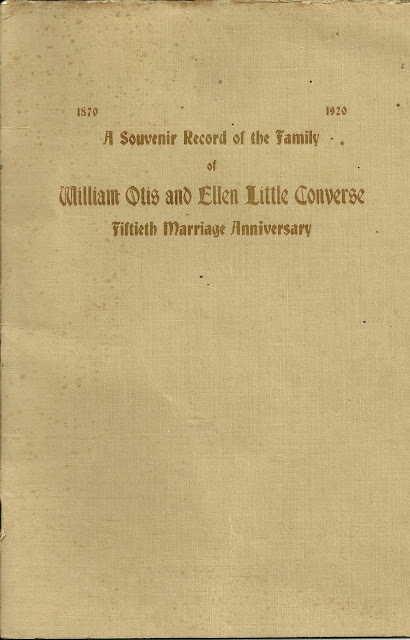 This is a Souvenir Record of the Family of William Otis and Ellen Little Converse Prepared for the Observance of their Fiftieth Marriage Anniversary Together with a Brief Biographical Sketch of their respective Parents, Henry and Niana Jones (Priest) Converse and Thomas S. and Anna Maria (Watson) Little, by Dr. A. L. Converse, Springfield, Illinois, October 20, 1920. Booklet, folio size, with 15 pages with text and pasted in photos of William Otis Converse and his wife Ellen (Little) Converse. Searching online, I found William Otis Converse, born in June 1840 in Painesville, Ohio, the son of Henry and Niana Jones (Priest) Converse. His family moved to Springfield, Illinois about 1846. He married Ellen Little, the daughter of Thomas S. and Anna Maria (Watson) Little, in 1870. The booklet has some interesting detail, going back to the Norman conquest of England and including some interesting sketches of family members as they made the trek west to Ohio and Illinois. The four daughters of William O. and Ellen (Little) Converse sound as though they all made successful marriages for themselves. 1940s-1950s photograph of the vessel "Grampus"